The Ashes: back where they belong! Superb. Absolutely superb. Saw it and everyone was shaking hands, swearing oaths and proposing toasts. Sad Aussies were cheered up with free pints before being ribbed mercilessly. A splendid and highly competetive Ashes Series! See you all in 18 months! Haha! England Captain Andrew Strauss lifts the legendary Ashes urn in victory! The England team go balistic as Australia are all out for 348. Hero of England, Freddie Flintoff, savours the glory of being a legend one last time before retiring from test cricket. A perfect picture of an English summer.. 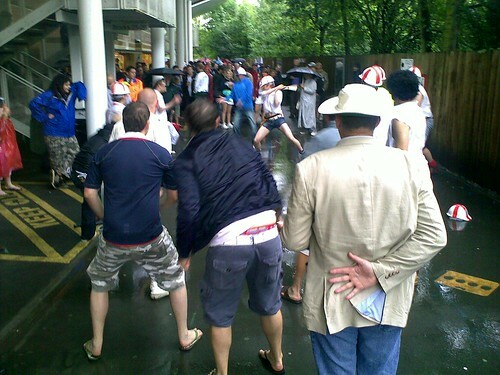 Rain, beer, cricket and lots of fancy dress: the ingredients for a perfect English summer. More photos from the test match later.